By the time Ricardo Gathers arrived at Baylor as the #34 recruit nationally in the class of 2012, he had already developed a name for himself as one of the strongest players in the country. Through his first two years at Baylor, Gathers bided his time in a reserve role behind NBA-talents Isaiah Austin and Corey Jefferson. Last year, however, with lower expectations for the team, Gathers' role and minutes increased dramatically as he helped lead Baylor to a surprising #3 seed in the NCAA tournament. Weighing in at 273 pounds at the USA Basketball Pan American team training camp this past summer, Gathers is one of the most physically imposing players in college basketball. He overpowers his opponents with sheer power and tenacity on the glass, finishing first among DX Top-100 prospects with 14.8 rebounds per-40 minutes and leading all college players with 153 total offensive rebounds on the season. Still, one of Gathers' biggest red flags as a prospect is that he's undersized for an NBA center. Measuring just 6-7 without shoes this past summer by USA Basketball, with a 6'11 wingspan, it remains to be seen whether Gathers has the height or length to play effectively against bigger and more athletic centers at the next level. Those concerns come warranted as Gathers leaves something to be desired as an interior finisher on the offensive end. Though he averaged an extremely impressive 6.2 offensive rebounds per-40 minutes, he has struggled to translate those offensive rebounds into easy offense, and doesn't have great shot-selection when it comes to deciding what to do with the extra possessions he generates. Per Synergy Sports Technology, 27.9% of Gathers' offensive possessions came off offensive rebounds  one of the highest rates in the NCAA. However, Gathers shot just 32-for-74 (43.2%) on those looks off putbacks, as he lacks a degree of explosiveness and can be very single-minded with his insistence on heaving up tough shots. Gathers' inefficiencies around the rim were evident throughout the season, as he converted just 96-of-208 (46.2%) on shots around the basket. While he showed glimpses of success with a consistent left hook on post-ups from the right side, the fact remains Gathers is quite limited as a scorer with no reliable source for efficient offense. To his credit, for a 275-pound behemoth, Gathers is deceptively agile and possesses very nice footwork in traffic. While his strides are small in transition, he still manages to run the floor well  though he notoriously reserves his fastest full court sprints for the offensive end. Slimming down would improve his stamina, though he relies on his weight to bang and create space effectively on the interior. Gathers gets to the line at an impressive rate, attempting 7.9 free throws per-40 minutes. Still, just a 61.3% shooter from the line, he needs to convert at a higher rate to make his prolific foul drawing a more attractive asset for NBA teams. Defensively, Gathers' effectiveness varies based on the situation. He's a glass eater with great instincts for both timing and positioning, which helps Baylor curtail opponents' second chance opportunities. Moreover, he uses his elite strength to prevent opponents from gaining good post positioning. He's comfortable defending the interior and is clever with his position, often baiting opponents to throw into the post, only to disrupt the entry feed. But while he dominates the boards on both ends, he's not long enough to survive as a rim protector in the NBA (1.4 blocks per-40) and he often looks overmatched by speed when he's forced to defend on the perimeter  an absolute red flag for a undersized big man in the evolving NBA. He's not the most diligent defender and can lose concentration of both his man and his team's defensive scheme, especially when forced to matchup against a floor-spacing big. Still, after exploding upon insertion into the starting lineup, Gathers has cemented himself as a viable NBA prospect, due to his one highly translatable skill--rebounding. He'll need to show continued progression as either a finisher on the interior or as a passer/decision maker in his senior season to ease NBA teams' concerns about his limited offensive ability. He'll also need to improve his free throw touch to not hinder his ability to take advantage of the tremendous energy he provides offensively. Defensively, his physical limitations will always be a hurdle he has to overcome at the professional level. Still, with another season to show improvements on that end of the floor, he has a chance to turn the negative defensive perception around. 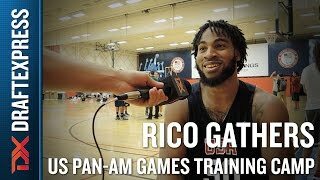 A video interview with Baylor forward Ricardo Gathers at the USA Basketball training camp for the Pan-American Games. As a high school player, Ricardo Gathers earned the reputation of a tough, physical and versatile post scorer on his way to being ranked as the #34 recruit in the Class of 2012. Thus far at Baylor, Gathers has been a role player, albeit on one of the nation's most talented frontcourts, but nonetheless an important contributor on a team that made a run to the Sweet 16. Baylor is now in rebuilding mode, having lost its two most productive post players in Isaiah Austin and Cory Jefferson. Now, Baylor needs Gathers, in particular, to take a significant step forward in order to survive a difficult Big 12 conference slate and try to make a second consecutive trip to the NCAA Tournament. Gathers is clearly undersized for the power forward position, standing around 6'7 or 6'8 with an average 6'9.5 wingspan, but makes up for it with a rugged 270-pound frame. Furthermore, he is a solid athlete, as he runs the floor well while displaying decent agility and quickness in the paint, as well as the ability to elevate at times around the basket when given a head of steam. Slimming down could help him maximize his athletic tools, as he isn't quite as explosive as you might hope from an NBA standpoint considering his lack of size and length, but physically speaking, Gathers has little trouble competing at the collegiate level. In his first two seasons at Baylor, Gathers was neither a particularly productive nor efficient player offensively, averaging 14.3 points per 40 minutes pace adjusted on a subpar 46% 2P% last season. Gathers doesn't really have a consistent means of scoring, as he lacks the size, athleticism or skill-level to be a major factor inside the post, showing average shooting touch and poor decision making ability. He struggles to use his left hand, and takes a lot of contested, low percentage shots, trying to bully his way to the basket, and having a difficult time getting his shot off against bigger and more athletic defenders. Gathers struggles equally in both in post-up (39% FG%) and non-post up situations (50% FG%) around the basket, due to his lack of size, length and leaping ability from stand-still positions. Gathers doesn't really seem to know his limitations, as he is somewhat of a black hole inside the paint, only dishing out 14 assists so far in his career in nearly 1300 minutes, or one every 92 minutes of action he sees. Only five college basketball players in our database (min. 15mpg) who went on to get drafted have posted an assist percentage lower than Gathers' rate of 1.9 percent since 2002. Gathers' bull in a china shop style of play does not come without benefits. On the one hand, his ability to draw contact with his sheer brute strength in these situations results in him attempting a very impressive 8.6 free throws per 40 minutes pace adjusted. On the other hand, he shoots just 58% from the free throw line, which means that many of these attempts end up going to waste. Gathers doesn't show much promise outside of the paint so developing his shooting stroke and at least becoming a reliable mid-range shooter could improve his prospects. That being said, one area where Gathers absolutely shines is rebounding his teammates' misses; his impressive 6.0 offensive rebounds per 40 minutes pace adjusted ranked sixth among all college prospects in our database last season, exemplifying just how scrappy and aggressive that he can be in that area. As good of a rebounder as Gathers is, he has some serious shortcomings defensively that he'll have to overcome. Gathers possesses neither the size or length most teams look for in a big man, and isn't long or explosive enough to be much of a rim protector. In addition to that, he looks like somewhat of a fish out of the water when forced to step out onto the perimeter, which makes it difficult to project him as a full time power forward either. He did a capable job of guarding the interior as a sophomore, especially when he was able to hold his position on the block, even though he sometimes gave up early on plays. Along these lines, his physical limitations are exacerbated by the fact that he neither looks like the most focused nor fundamental defender. Perhaps case is in point is the fact that Gathers is one of the top rebounders among prospects in our database, in the same league as bigger and more athletic players. Though not the tallest or most athletic player, his productivity on the boards can be chalked up, in part, to grit and fundamentalsso it will be interesting to see if he can translate this hustle to other parts of his game as well. After two seasons as a reserve, Gathers' junior year will offer scouts a much better sense of his NBA prospects. In particular, scouts will be watching to see if he can make the most of the increased playing time and possessions that he will almost certainly receive as the most seasoned member of Baylor's returning frontcourt. That being said and though there is a lot to like about Gathers' potential, he has a long way to go before getting there. While Gathers may not grow, he can offset his physical limitations by continuing to diversify his game on the offensive end, particularly working on his left hand and developing a reliable jumper, and by working harder on the defensive end of the floor. A breakthrough season could go a long way in resolving some of scouts' concerns about his future and boost his stock as an NBA Draft prospect. Ricardo Gathers (#34 Scout, #37 Rivals, #40 ESPN) had somewhat of a mixed showing here this weekend, on one hand displaying many of the traits that make him a very highly ranked prospect who is likely to be very productive at the next level, but on the other struggling in a few areas on both ends of the floor, putting some of his warts as a player center stage. Not much has changed physically since we last profiled Gathers, as he remains a man amongst boys from a strength standpoint, even though he's undersized for his position, measured at just 6'6 in shoes with a 6'9.5 wingspan. Gathers' mass doesn't really hold him back athletically, either, as he runs the floor well and is capable of powering up for explosive dunks in the half court. On the offensive end, Gathers is at his best operating in the low to mid post area, where he has a solid repertoire of moves, an excellent ability to back down his opponents, and good touch. He can spin off both shoulders and makes use of turnaround jumpers and right-handed hook shots, but he's at his best finishing strong with drop steps and going up hard to the rim or drawing contact and getting to the free-throw line. While Gathers made good use of his post game on occasions here, he was much more reliant on his inconsistent perimeter game, where he shows the ability to face-up and hit jumpers from mid-to-long range, but doesn't have great shot selection and is prone to taking many ill-advised, contested, pull-up jumpers. He gets decent results on his shot when open, even if it doesn't have the prettiest mechanics, but the bigger problem is he just is nowhere near as efficient or effective in this area of his game as he is down low, and his team suffered for it in their 77-65 loss to Gonzaga College high school. On the defensive end, Gathers' problems were more cut and dry, as he had an incredibly difficult time defending unheralded 6'5 combo-forward Kris Jenkins, who finished with 30 points on 12-for-16 shooting, mostly matching up against Gathers. Gathers was abused on the perimeter, and doesn't really show the fundamentals, lateral quickness, or focus to consistently defend stretch 4's, something that is concerning going forward. Gathers didn't look great defending down low either, and has some concerns there as well with his height, while he also did a poor job doing simple things like boxing out and staying involved in plays. Looking forward, Gathers needs to do a better job playing to his strengths offensively and putting in as much effort and focus as possible on the defensive end to mitigate his mismatch shortcomings. He clearly has the tools to be an impact player at the college level, but how wisely he utilizes his skills and if he shows the ability to adequately defend 4's will likely determine his pro potential. A physically developed, undersized big man, Ricardo Gathers (#34 Scout, #37 Rivals, #30 ESPN) is a skilled and aggressive offensive player who dominates at this level of competition with his terrific combination of strength and versatility. Standing somewhere around 6-7, with a frame reminiscent of an NFL linebacker, Gathers has excellent length and good athleticism. He can score from pretty much anywhere on the floor, be it posting up, handling the ball in transition, creating off one or two dribbles from the perimeter, or knocking down mid-range jumpers. He's able to get things done in a very impressive manner thanks to his skill-level and tremendous motor, and also competes admirably defensively and on the glass, making him exactly the type of big man a college coach would love to have. Gathers is a couple of inches undersized for a prototypical power forward, which is why recruiting analysts don't seem to be unanimously in love with himhe's only ranked in the 30-40 range at the moment. There are plenty of players his size in the NBA, though, so that obviously wouldn't automatically rule him out. If Gathers can show that he can continue to dominate other players his age as he makes the transition to the college level, he probably won't stay at St. John's for very long.